We’ve got all new cute and (not so) cuddly ready for you to experience on the shelves now. Come find something to inspire you! 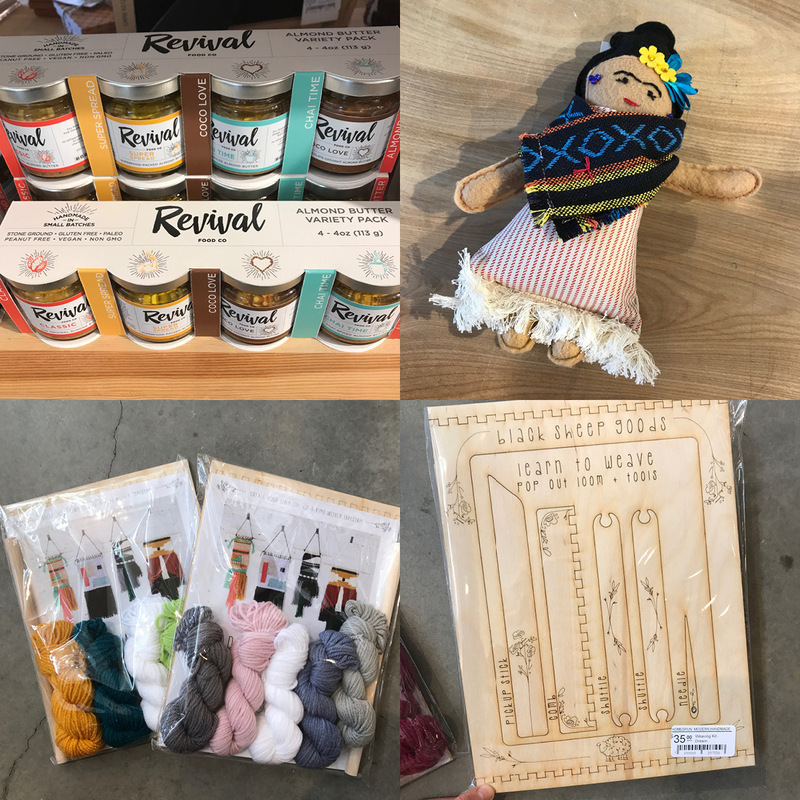 Revival Food Co. variety packs are where its AT for almond butter, La Tiendita makes a variety of these incredible Frieda Khalo dolls, and spend some time weaving in the sunshine this season with new kits from Black Sheep Goods. 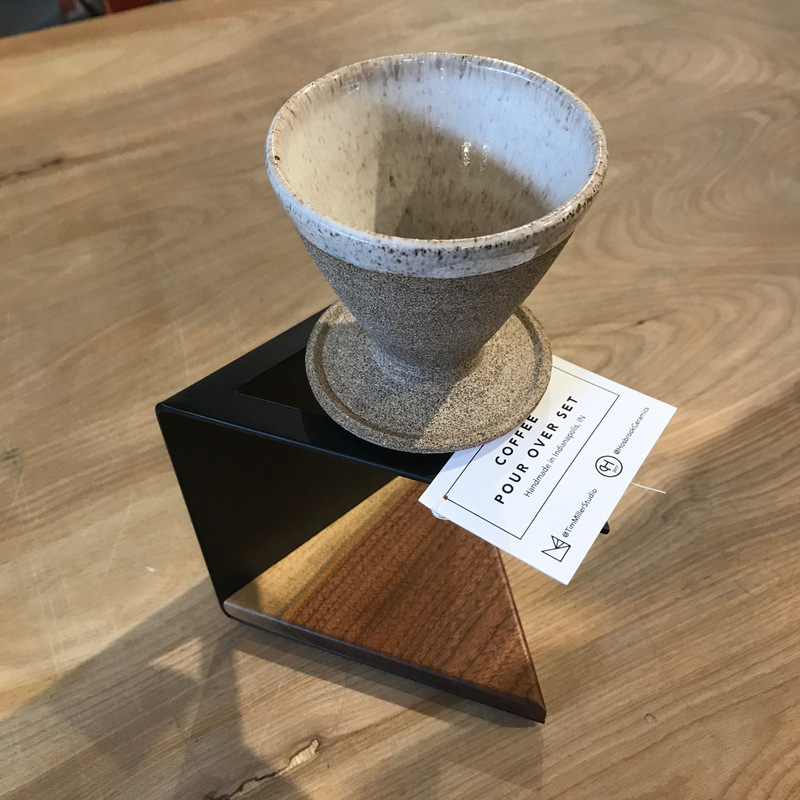 Gorgeous new modern pour over sets are a collaboration between locals Tim Miller Studio and Hosbrook Ceramics. 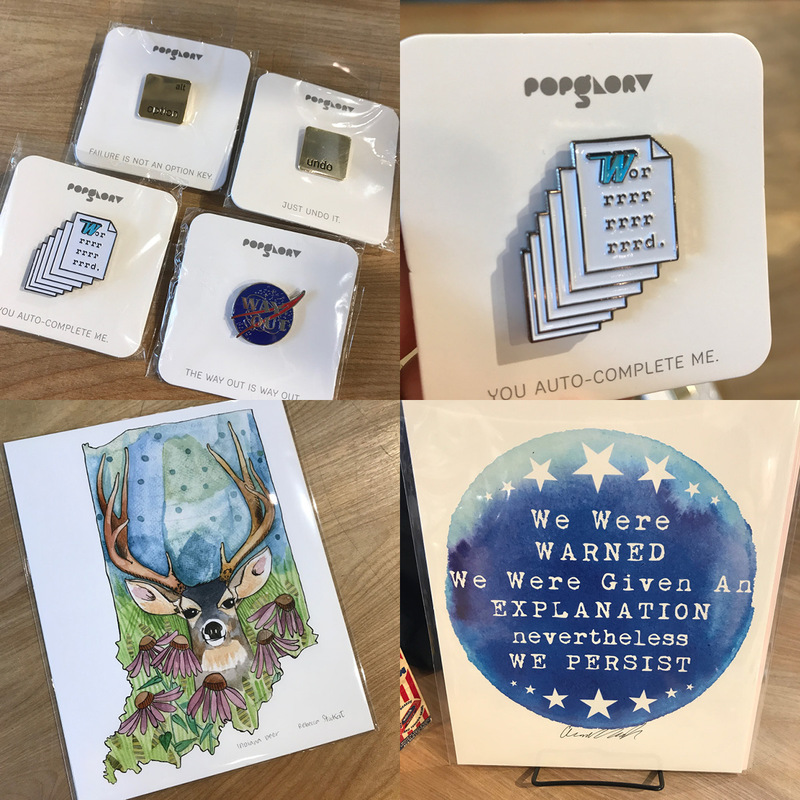 Lots of new, hilarious pins from Popglory, “persist” prints done by a local high-schooler to raise money to travel, and new prints from Rebecca Stockert. 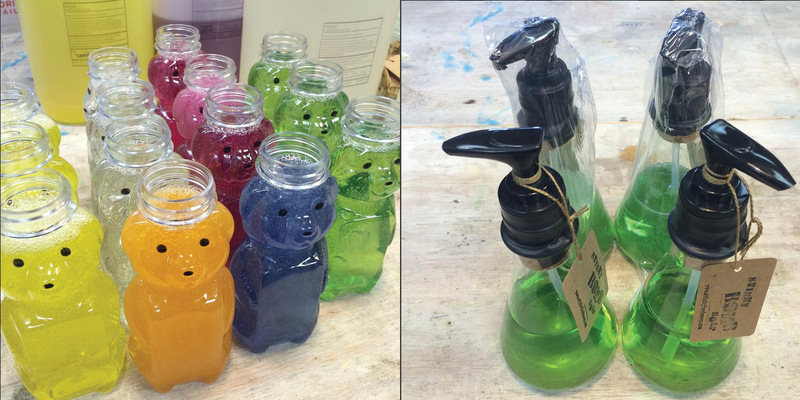 And here we have the aforementioned “not so cuddly” new products. 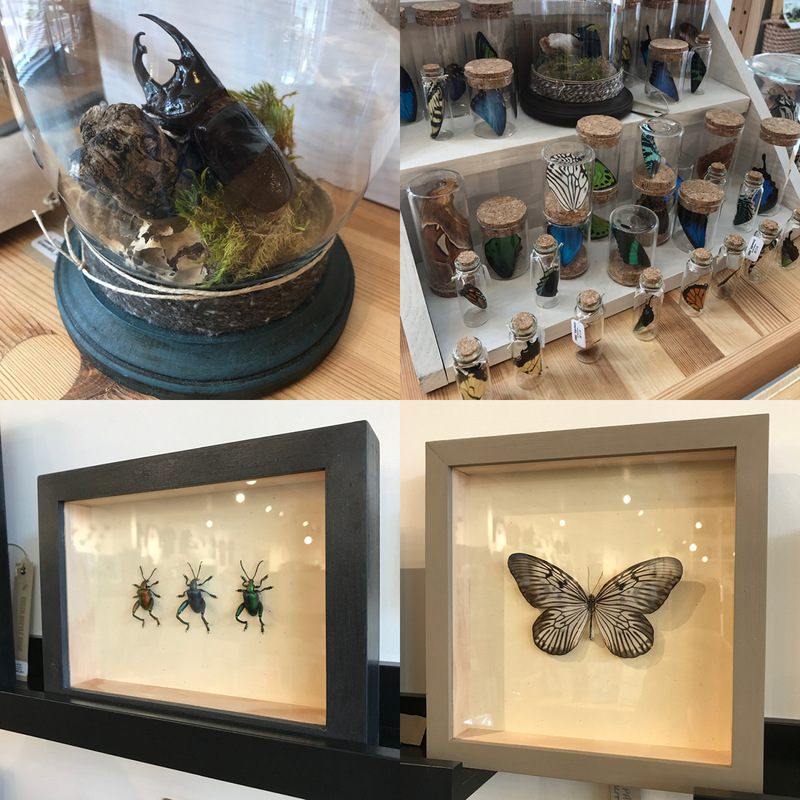 These incredible bugs are ethically sourced by and mounted by Green Beetle Shop. 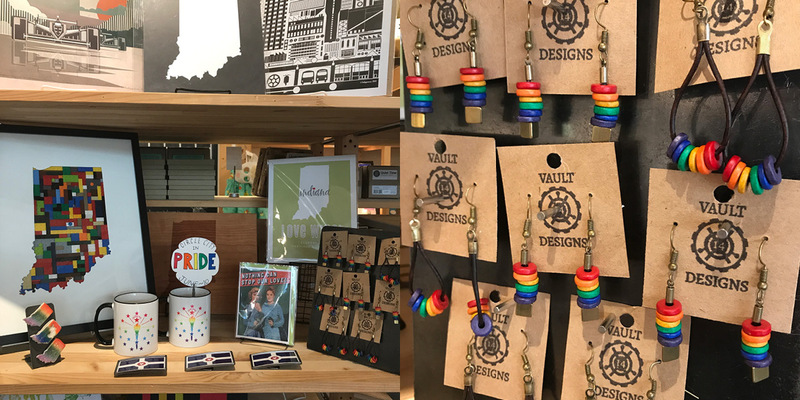 We are ready for IndyPride! Love these colorful new earrings by Vault Designs. 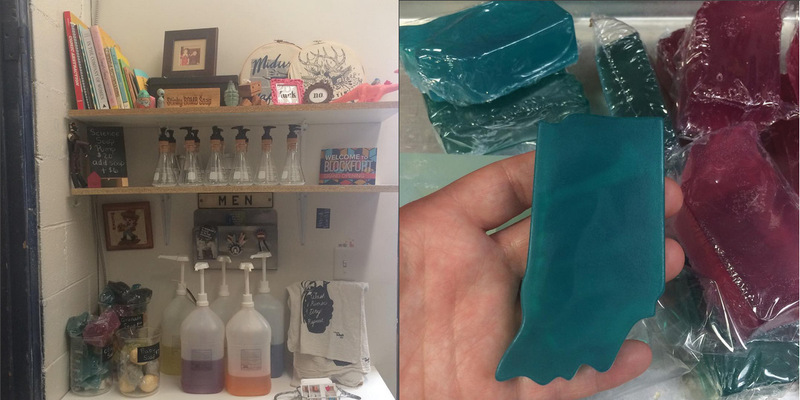 Megan Green of Stinkybomb Soap definitely has a sense of humor and an appreciation for the eccentric. 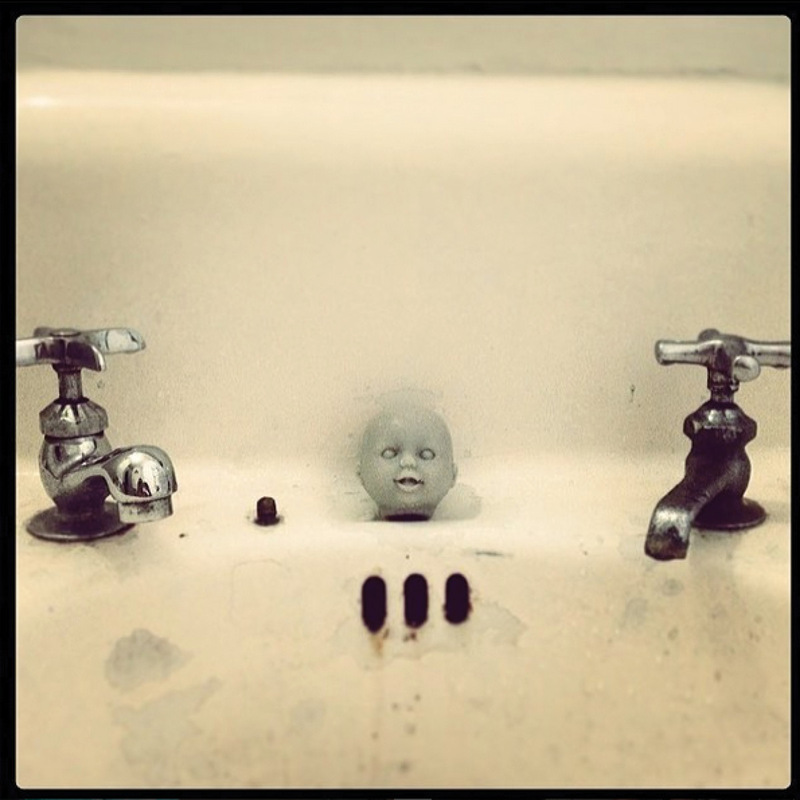 Whether your looking for a laugh or want to give someone the heebie-jeebies, this soap company is the place to go. Learn more about what their aesthetic and why they love to create the creepy. Our elevator speech is simple: We take iconic shapes and turn them into ironic soaps. Shapes like hand grenades, baby heads and state shapes. I love the process of design and seeing an idea out from start to finish. Tinkering around with not only the product itself but also the packaging becomes a challenge I like taking on. The end result from raw materials to an item that can sit on a store shelf then find itself sitting on a bathroom sink is very rewarding. 3| Describe your typical work day. My day starts with kids and getting them ready for school. Then I’m either off to my production space producing or packaging and order or at home working on my other creative endeavors..Craftin’ Outlaws a craft show held twice a year here in Columbus and putting on the other DIY inspired events which helps build up the handmade community keeps me pretty busy with emails. As does, Midwest Craft Con, a non-profit which holds a 3 day creative retreat at the beginning of the year which I am 1 of 3 directors. Then it’s back to after care for the kids, homework, meal prep and some downtime. 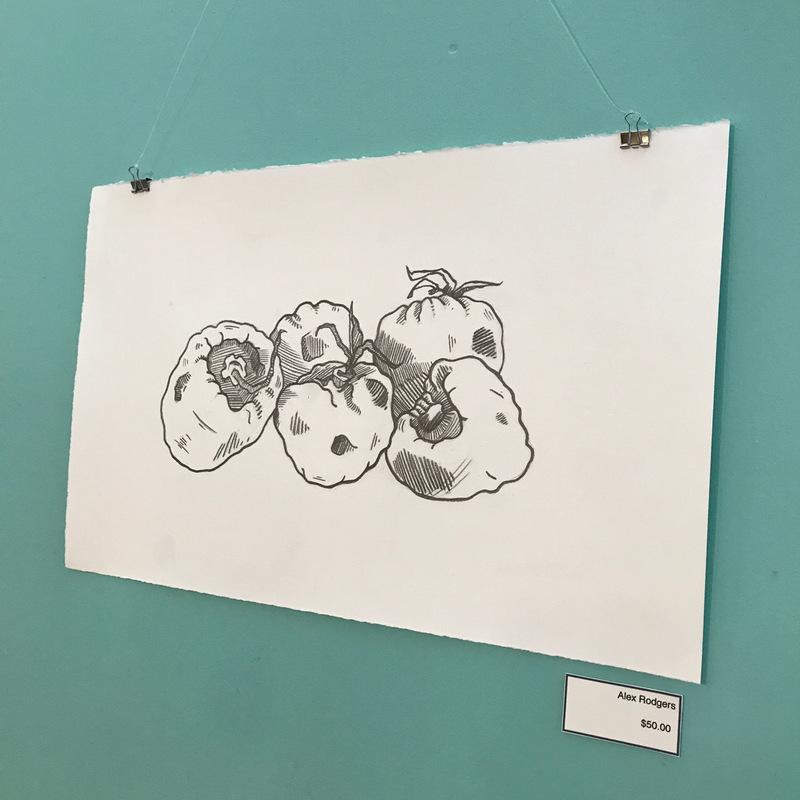 4| Can you describe your process a bit? 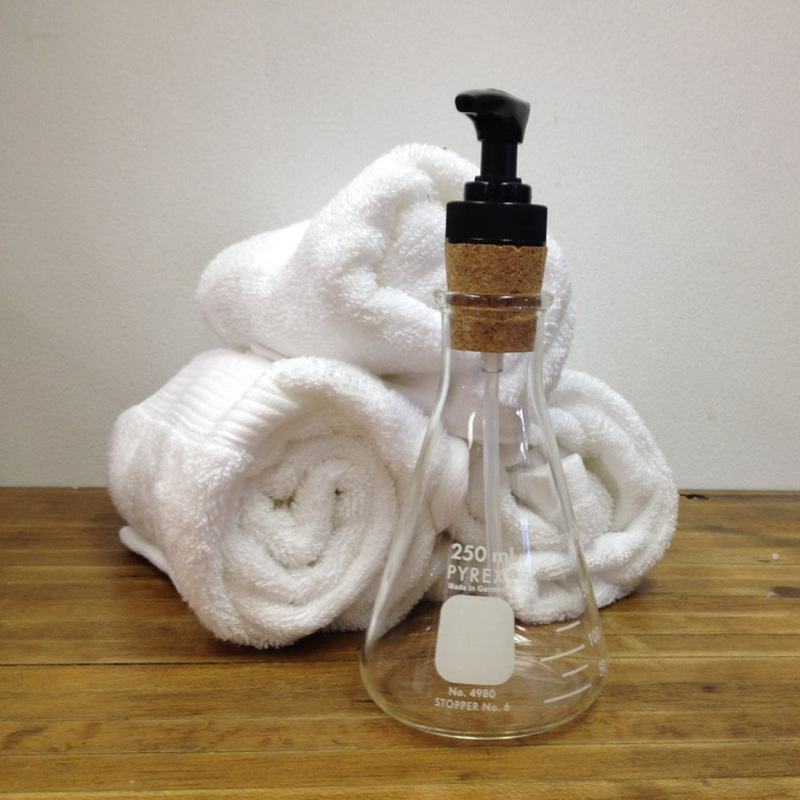 How do you make a bubble bath or one of your soaps? The soap we focus on is a melt and pour process. The prep has all been prepared for us, we melt blocks of it down at a time and then add it the scent and fragrance into one of our custom made molds. Each soap takes about 1-2 hours to harden before we can release it from the mold. I can prepare the hand stamped box with all the labels needed. We then release it from the mold when it’s fully set up and place it into a plastic, heat sealing container. This keeps the scent fresh until a customer is ready to open it. 5| You hear the name Stinkybomb and you know you’re in for some laughs. Any new product ideas on the horizon? At this time I am exploring getting back into cold process soaps. A process I haven’t explored in a while. It’s such a formula based creation so it would require more time and lots more trial and error. These would be less mold specific but still a great scented experience that Stinkybomb has been known for. Working for myself was always the dream. Stinkybomb itself was an “aha” moment. The idea came to me from no where and it’s been a fun ride that has giving me a chance to travel and opened up many doors. I had a production studio in a warehouse in Columbus, Ohio. We are currently moving from one space to another. Until then we have had to shut down our daily production. We hope that we are only down for a few months. 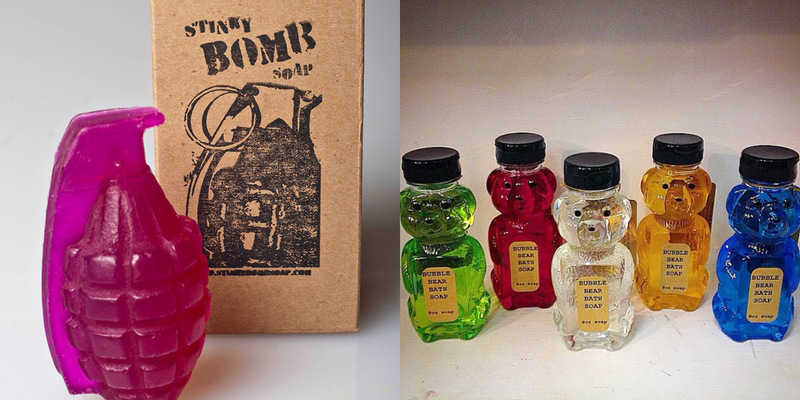 8| Glitter, baby doll heads, honey bear bubble bath: describe the perfect person and occasion for a Stinkybomb gift. Definitely anyone with a sense of humor! It’s been fun to learn that each product carries it’s own customer type. We still tend to attract those people who are looking for a quick gag gift. I could throw a dart at many of my friends but I like living in my head just fine. Knowing the craftsmanship behind an item. How it’s made but also who makes it and their own backstory. 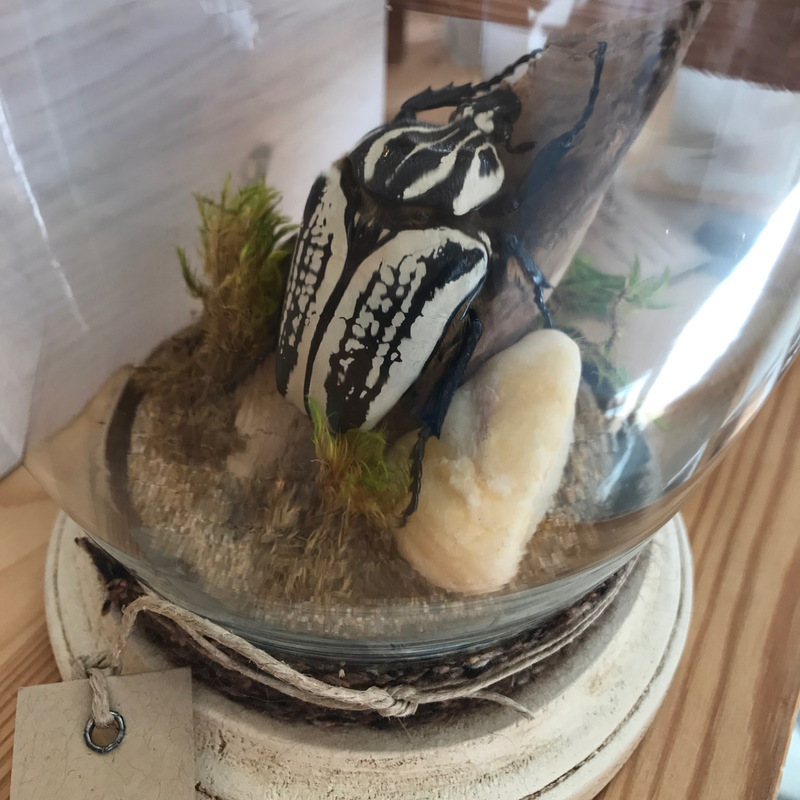 The first piece of art my husband and I purchased, we were then dating. It’s a photograph of a hand carved female wax mannequin from the turn of the century. The mannequin had striking features and real hair was used. The building which housed many forms had caught on fire so a portion of the face was burned and broken. Leaving behind a beautiful but scared portrait. The photographer learned of the warehouse and captured the “soul” if you will of the form. One day I’d like to complete a marathon but then again I enjoy my couch and Netflix too much to start training any day soon. -I have two kids a daughter, 8, and son, 6, who remind me that life is adaptable but will constantly change on you, so learn to be flexible. -I love to cook but my family dislikes most foods so there are always leftovers. -I enjoy window shopping for industrial furniture and like owning things that require tetanus shots. Need more Stinkybomb in your life? 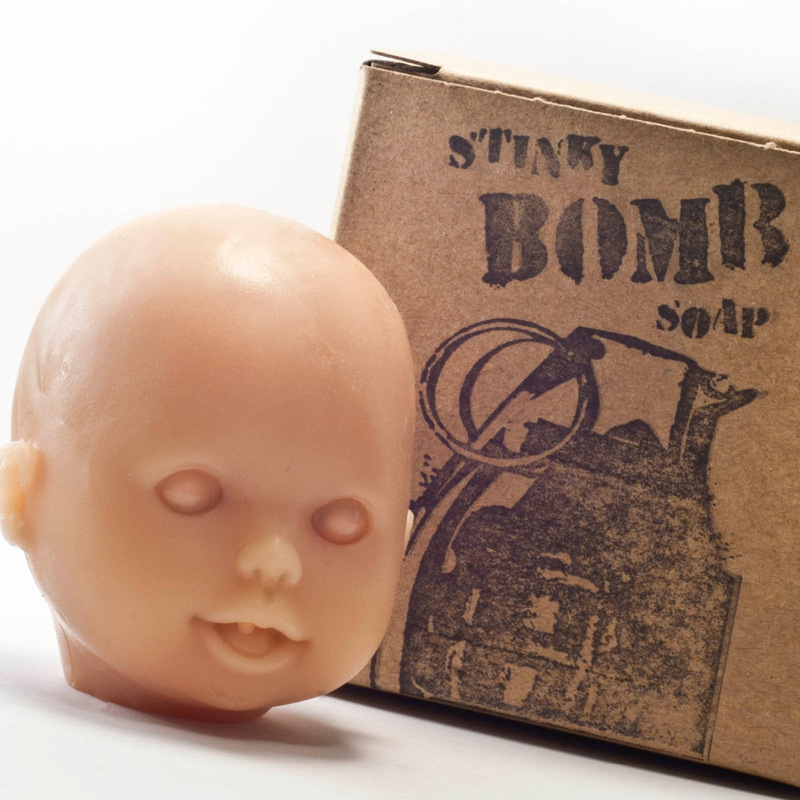 Get over here to Homespun and buy some, or visit them at their website or on Instagram @stinkybombsoap. 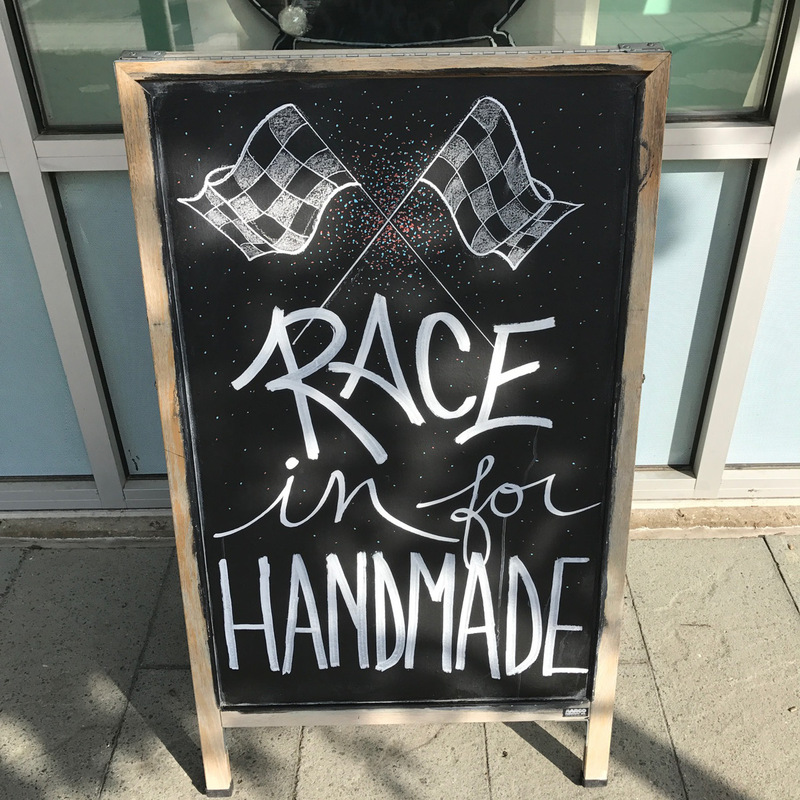 Race in! Weathers beautiful and our spring shelves are sporting some fresh new handmade goodies. Love these sweet new tees from Terz Ink. Spread some seed love- the perfect activity for a beautiful day, seed bombs from Visual Lingual. 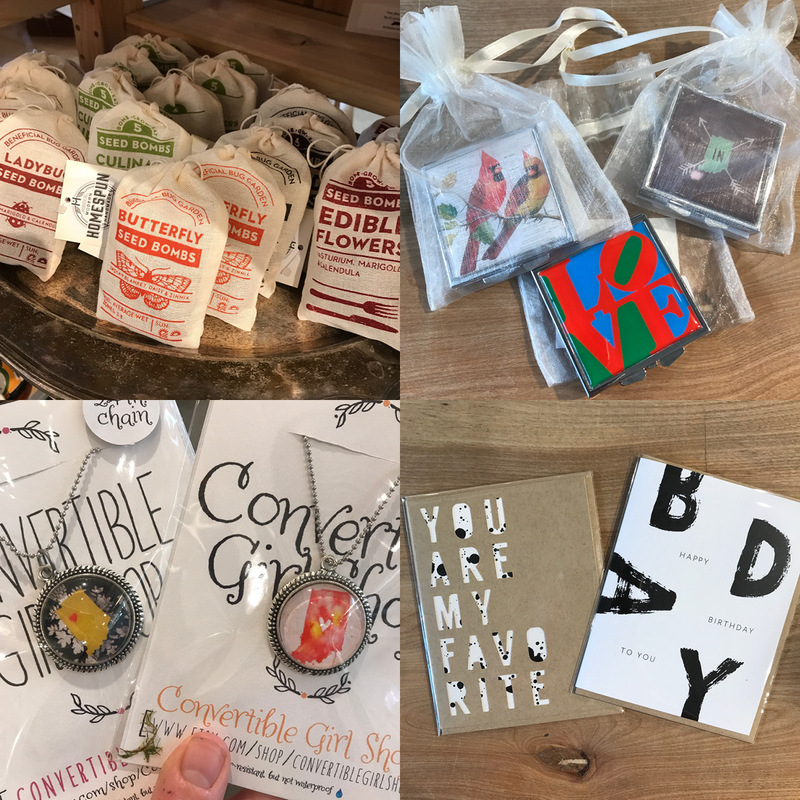 Little square pill boxes from Covertible Girl Shop, new cut paper cards by Evermore Paper Co. based in Chicago. 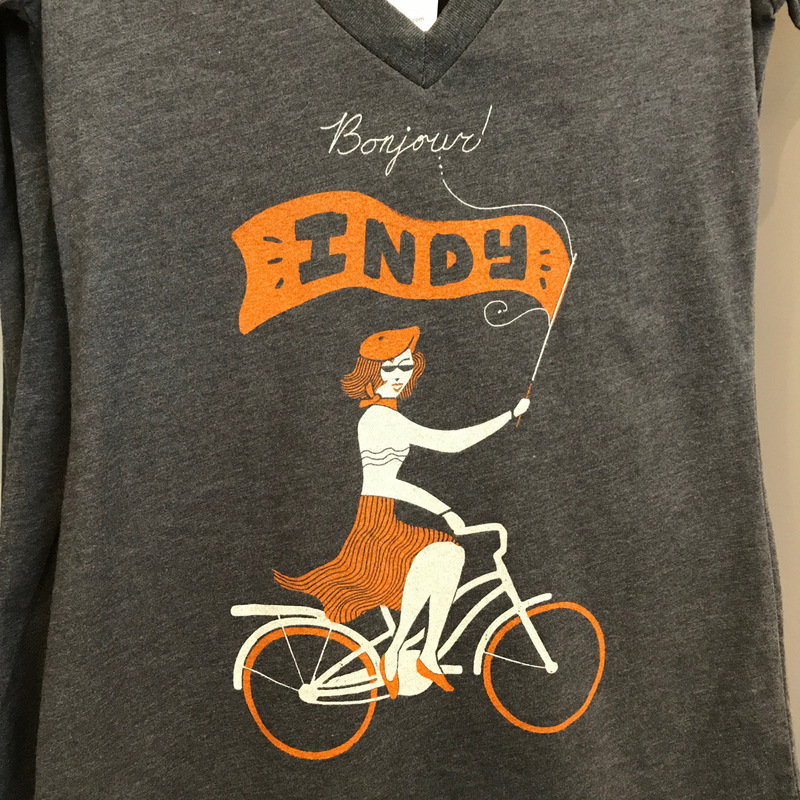 Also a little Indiana love in the necklaces also by Convertible Girl Shop. 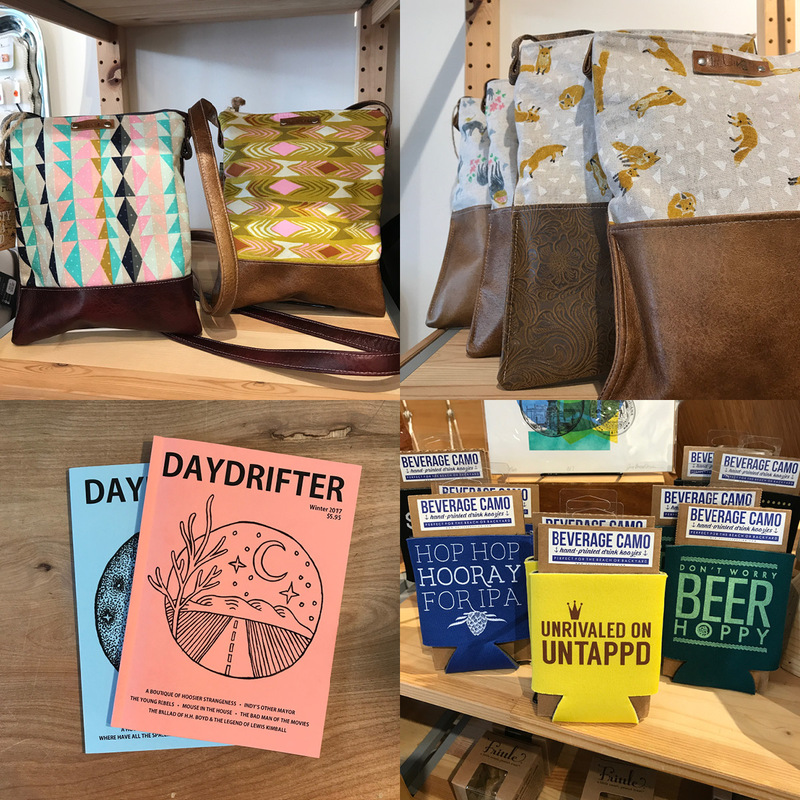 Leather and cloth bags, new from The Ruka Shop. Exit 343 brings us these amazing “beverage camo” beer coozies, and stories for you in two issues of Daydrifter. Beautiful cut paper notecard sets by Evermore Paper Co. We have a brand new vendor, twig + birdie, bringing us high quality oils and bath products. 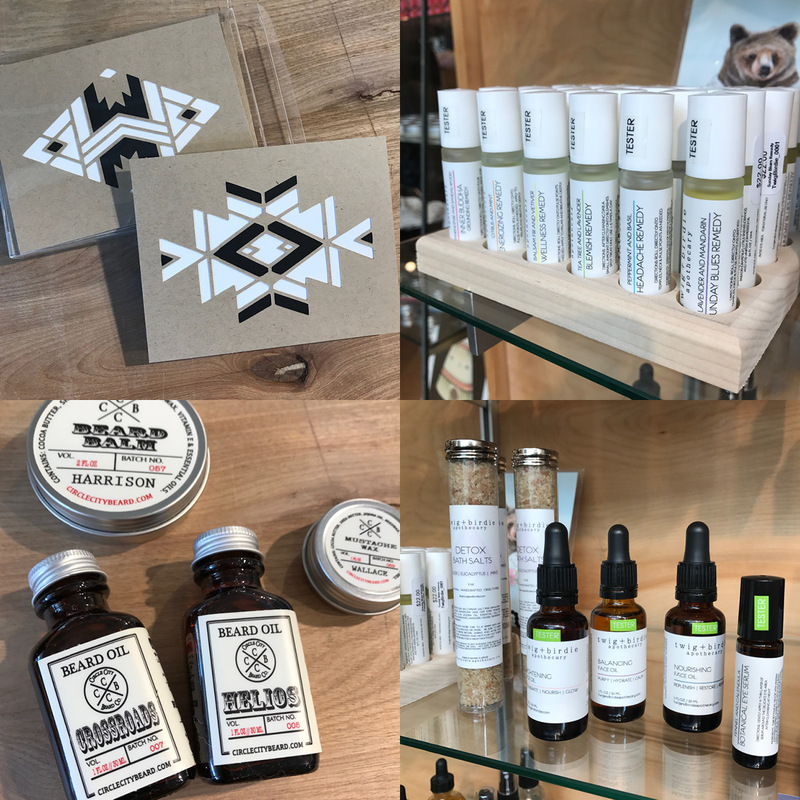 Circle City Beard Co. is also freshly stocked with all the right stuff for your facial hair needs. 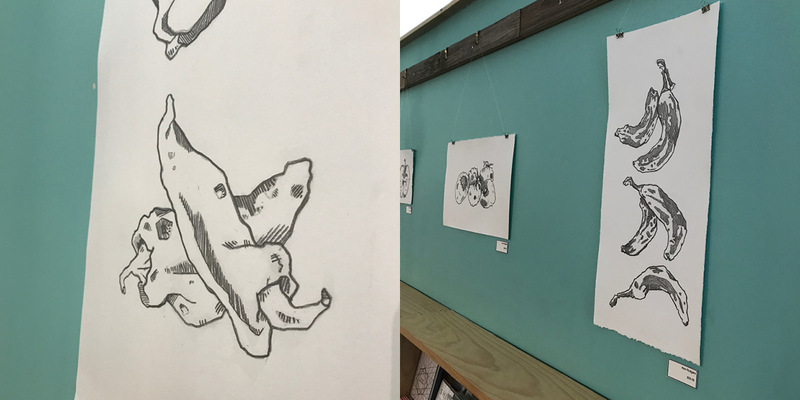 Perfect organic line drawings by local artist Alex Rodgers, now hanging in our gallery.